This Time Tomorrow: snow day! On days like these (read: on days when we get over a foot of snow over the course of several hours) I like to a.) work from home because I drive a Honda Civic and don't have any desire to wait for AAA to dig me out of snow banks b.) pump my space heater directly at my feet c.) listen to Cat Power's "The Covers Record" over and over again. What do you guys like to do on snow days? That looks amazing!!! I love how the bright pink looks in all that white fluffy snow!! I wish we got that much snow here! Suchhh cute pictures! I adore that necklace! boo, I've never seen snow but your outfit looks good given the weather! Cat Power is soo good btw. Whoa, you Renoites don't eff around with your weather. You look fab! On my snow days, I drink copious amounts of tea, watch my favorite shows, and wear lambswool slippers all day. I like to drink candy cane hot chocolate on snowy days. p.s. I love the outfit as well! If it actually snowed here I would build a snowman. I've never gotten a chance to build one that wasn't 3 inches tall. Oh and make snow angels. I wish I had that much snow!! Love your coat! If I had a snow day, I'd be keen on wearing my bathrobe and slippers all day, not showering until 4:30 and watching a marathon while cuddling with my cats. Heaven. 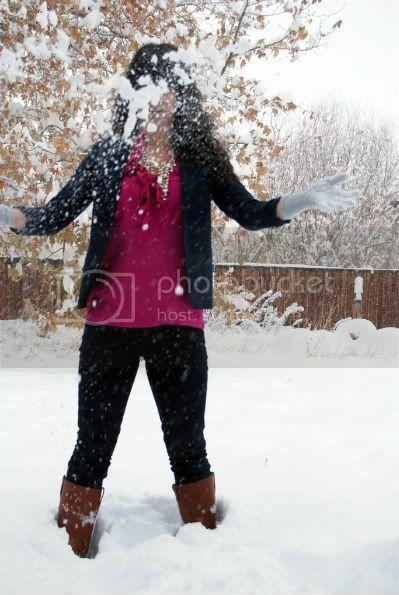 Fun snow pics! Love that necklace. ERGGGGGGGH. I am way too jealous of you right now. Beautiful in the snow! I love it! 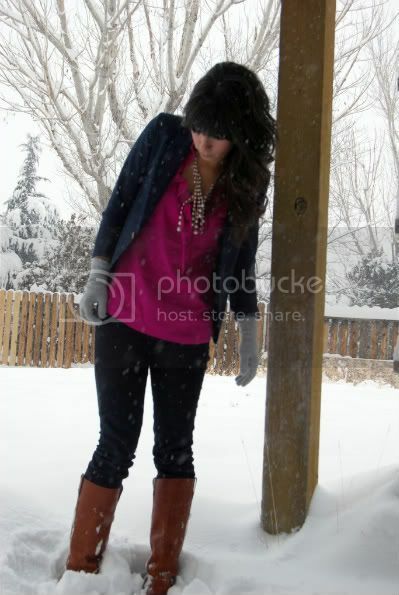 We had some snow in Boston last weekend and I love it!Love your pink bow tie blouse and your necklace! So cute! Jealous and love your pics! Pearls are perfect for snow. Your necklace is perfect with that top. I don't live in snow area but it's definitely freezing (for So. California standards;)So the heater pumping is definitely a must! Oh my gosh, that snow looks WONDROUS! I'm totally in awe. I like to snuggle up and listen to Bon Iver. cute outfit. you're not freeezing??!! Now this is what I call snow. My sad little snow day pictures pale in comparison!!! Some hot cocoa or egg nog is always my fave part of snow days! First I have to say: I love your pink shirt! it's amazing with the neckless! and I like so much the pictures! where do you live? because the snow! ;) sorry I'm so gossip!haha! oh your Monday sounded perfect, full of tomfoolery! I love how the pink pops in the snow! wow, we got snow- but nowhere nearly as much as you! I'm jealous! On snow days I love cranking the heat, listening to Maine Public Radio, working in my studio, and taking snuggle breaks with my cats. Snow days are my favorite type of weather! I adore the color of that top. AMAZING. Last year was the first time in ages we had proper snow in England. I hibernated! I don't know how to drive in snow!! SO jealous of the snow! I am going to have to wait until I am in Ohio for the holidays to have the change to experience any! Your backyard looks about like mine. I love to spend my snowy days inside reading and playing with my cats. Not today though, I had to work. Sad day. Love your outfit, especially the pearls. I'm jealous of your snow days - we don't get any in Florida. Gorgeous pictures! Love that top- they color is beautiful on you! 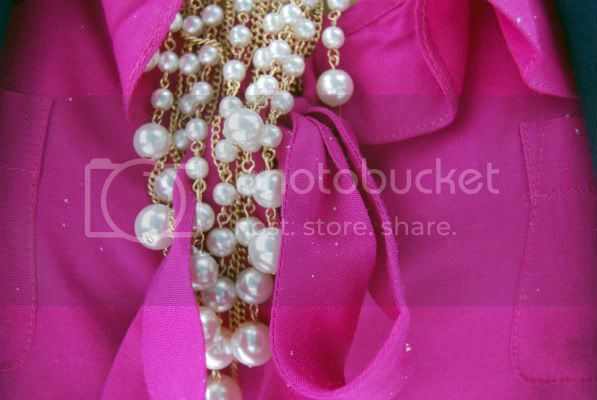 Your blouse is the perfect pink! Love the necklace against the hot pink! Looks like you were having a great time playing in the snow! You look lovely in pink, you should wear it more often!